Rivers swollen from the hurricane could spill over — and residents are scrambling to do all they can to prepare. GEORGETOWN, S.C. —They survived Hurricane Florence's powerful wind and driving rain, but now residents in coastal South Carolina are wondering how they will make it through the historic floods that are forecast as a result of the swollen rivers that the storm left behind. Georgetown — located on Winyah Bay, where multiple rivers converge — is expected to see record flooding as a result of Florence, which made landfall as a Category 1 hurricane 11 days ago in Wrightsville Beach, North Carolina. While the brunt of the storm was felt to the north, with just some downed trees and minor flooding in Georgetown, which is the seat of Georgetown County, they are now expected to get record flooding when bloated rivers run over. Earlier in the week, county officials urged nearly 8,000 Georgetown residents to evacuate ahead of a "record event" of up to 10 feet of flooding, the Associated Press said. The flooding was expected near parts of the Pee Dee and Waccamaw rivers. 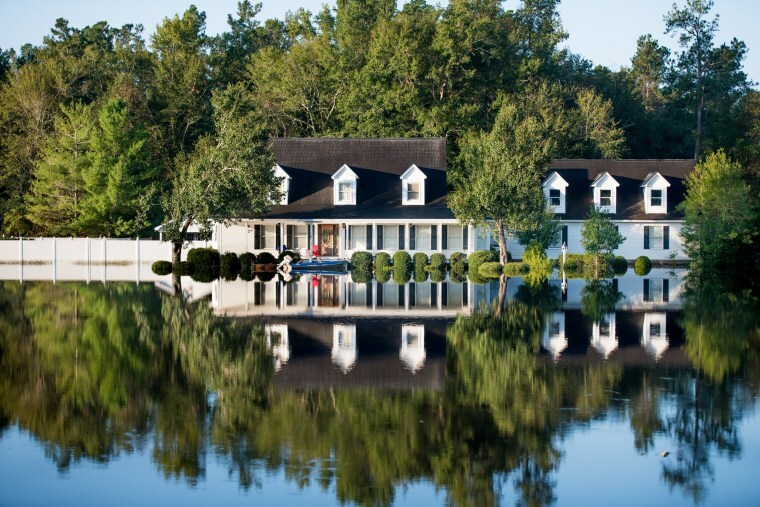 Already on Tuesday, in Conway, North Carolina, just 35 miles or so north of Georgetown, multiple feet of water had already filled the streets, damaging homes, reported NBC affiliate WMBF News in South Carolina. "This area's never flooded before. It should never flood,” Conway City Administrator Adam Emrick told the station. To make matters worse, more rain is forecast for the area. An area of low pressure south of Cape Hatteras, North Carolina, could become a tropical depression Tuesday as it approaches the coast, according to the National Hurricane Center. Even if it doesn't, it will still bring rain to coastal North and South Carolina. Georgetown County officials anticipate floodwaters will deluge bridges, and the crest is not expected until Thursday. Maring said he feared it "could be catastrophic," but said he was hopeful his business — and city — would survive. "George Washington spent the night in Georgetown, so we have been around for a while. And we hope to be around for a long time," he said. "So we're going to take this flood, we're going to persevere, we will rebuild we will do whatever it takes." MIke Fomil reported from Georgetown, Gabe Gutierrez from Conway, S.C., and Elizabeth Chuck from New York.